Do you like these containers? My mom folds these when she's over babysitting. They make great use of old magazines and are perfect little plates for snacks. Above - a Jamaican sweet potato pudding cake with rum raisins and coconut. I'm sure looking at this you fall into one of two camps "Damn that's nasty" or "I want that right now - topped with whipped cream preferably". What else is happening in the world of harvesting and seasonal eats? Link below please. I'm seriously low on creativity and ideas right about now. Thanks to those of you who are linking. I hope more will join us when there's actually something to harvest all the time! This morning, after my husband's out of the ordinary 3-day gushing (e-mail and in real life) over this little monchichi thing, and after I refused to go upstairs and look at the photo blown up on the screen, I said, "What are you - a 10 year old girl?" He retorted by telling me I had no soul. So for all the world to know, I declare: IT'S CUTE!!! It's really freaking adorable!! See the site below the photo for more furry sweetness. lol, I remember the Apple Dumpling Gang from whem I was a wee little lad. How funny, I had forgotten all about those two goofs. :) Bet the grandson would like to see them. The Jamaican sweet potato pudding cake with rum raisins and coconut sounds very good. Jamaican sweet potato pudding cake? Yum! I have a recipe for a kabocha pie I've been meaning to try. It kinda looks like that. That monchichi is adorable! The sweet potato pudding looks amazing!! Recipe, please!! I LOVED the Apple Dumpling Gand when I was a kid. Don Knots still cracks me up! I think I'm going to have to put this in my movie que and force my teens to watch it with me. 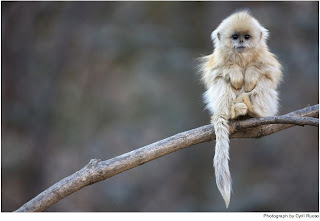 And yes, the monkey is incredibly cute!! My kitchen creativity is at an all time low, so I am adding nothing, taking away much. Sorry 'bout that. I'll try to get my mojo back soon. The monkey is very cute! The monkey is cute but i don't like them invading my garden to steal my tomatoes! That cake looks like it was rejected from the Island of Misfit Cakes. Sorry but it looks and sounds disgusting. But the monkey's the cutest thing I've ever seen!